We all love to run. We all like a well-stocked aid station with knowledgeable workers who seem to know what you need without really being asked. We all love well-organized races with great course markings, good maps and clear explanations of the rules, and an easy to navigate registration process. Have you ever thought about how all of those things come about? It is due to a dedicated group of volunteers – including Race Directors. 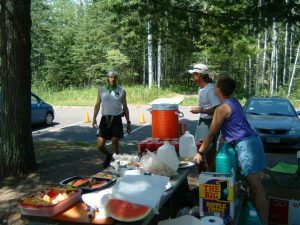 Every race is in need of volunteers, including the Spring and Fall Series, the Minnesota Voyageur, and the Eugene Curnow Trail Marathon. When looking over your season schedule, work in a weekend (or two or three) or a weeknight to help out at a race. Seeing the event from the other side of the aid station table is great fun! Time commitments vary and the work can be appropriate for people of all ages – in other words a way to include non-running family and friends in one of your favorite activities. Contact Us if you are interested. Our series give points for volunteering, which qualifies as race participation for the Ella Fennessey Award! Choose a race and jump in to the volunteering pool! The water is fine and you may just have the best time of your life!